ORO explains how bonds and debt funds work by using the familiar example of FDs. Bond Fact#1: If a bond is held to maturity, it is similar to FD in the sense that the payoff is known in advance. 1. There is a definite maturity period. It is not a perpetual instrument like equity. 3. An investor gets a known lump sum amount equal to the face value of the bond at the time of maturity. As a result, just like with an FD, if an investor chooses to hold a bond to maturity they know exactly the amount that they will get back in advance (One unknown is the credit risk i.e. that the issuer will default but that also exists in FD, a point we discuss later). Bond Fact#2: Bonds do not always have to be held to maturity. Investors can sell their bonds at the prevailing market price and make an additional gain/loss over the interest income. Price of the bond moves negatively with interest rates. The big difference between FDs and bonds is that bonds are tradable but FDs are not. As a result, bonds have a price not necessarily equal to the lump sum amount you will get back (face value). Also unlike an FD where if you exit early, you will always have to pay a penalty, you can exit the bond position early and still make a profit if the price of bonds has gone up in the meantime. So how is the price of bonds determined? To go back our FD example, suppose you made the FD today with 100Rs @ 8% and tomorrow the bank reduced FD rates to 6%. In such a situation your FD has become more valuable. If you could sell an FD, then there will be a buyer who will pay you more than Rs 100 to buy that FD. In fact, people would keep bidding up the price until the yield that they get on their money is 6%. At that point, they would become indifferent between buying your FD and opening a new one with the bank. On the other hand, if the FD rates instead went up to 10%, then your FD has become less valuable. If you wanted to sell the FD, then you would get less than Rs. 100 for it. In fact, the maximum price you would get from the buyer is one which ensures that his yield is 10%. Only at that price would he be indifferent between buying the FD from you and opening another one at the bank. This is exactly how the pricing of bonds works. Bond Fact#3: The prices of bonds with higher maturity move more in response to changes in interest rates. As a result, higher maturity bonds are considered riskier. They also offer a potential for more gains (losses) in case interest rates go down (up). Revisiting our FD example again. Consider two situations. One in which you have just invested your money in a 1yr FD at 8% and rates tomorrow become 10%. Second where you have just invested your money in a 5yr FD at 8% and rates tomorrow become 10%. The second situation is worse because you are locked-in in the lower rate for a longer period of time. The same thing is true of bonds. While all bond prices go down when interest rates go up, prices of bonds with more time to maturity go down by more. The same is true when interest rates go down. Price of bonds with a longer time to maturity go up by more because the higher interest rates have been locked-in for a longer period of term. The technical concept relevant here is duration. Duration of a bond is the percentage change you would expect at the price of the bond for 1% change in interest rates. Duration is very closely related to the time to maturity – higher time to maturity is almost all of the time associated with higher duration. For those interested in technical details, the duration is the weighted average time to maturity i.e. it is an average of the different time horizons when we expect payment from the bond weighted by the payment expected at that time. 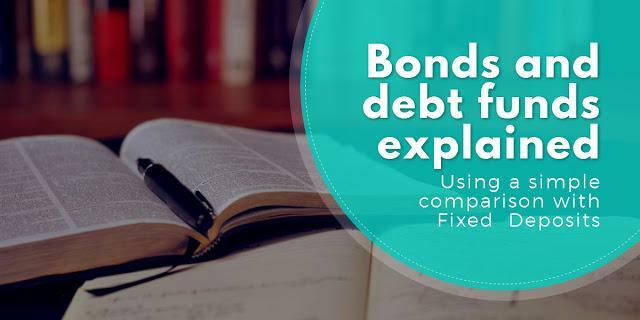 Bond Fact#4: Bonds, like FDs, have credit risk or the risk of default. With FD you take credit risk of the bank (very safe). With bonds, you can go for extremely safe issuers like the Government of India or more risky issuers who promise more interest. Even though most people do not realize it when they start an FD with a bank, they are taking the credit risk of the bank – If the bank is not around in 5 years time, then they may not get their money back. Similarly, when you buy a bond you take the credit risk of the issuer. The issuer can be the Government of India, in which case the credit risk is close to 0 (even lower than your bank). Or the issuer can be corporate. Corporates can have a varying degree of credit risk as summarised by their credit rating. In general banks (whose credit risk you take with FDs) are considered to be very safe. Lower-rated issuers offer higher coupon rates for the same maturity to compensate for the higher risk of default. Bond Fact#5: Bond funds can offer the benefit of holding a diversified portfolio of bonds while tackling the problems of low liquidity in individual bonds and low investment amounts. While so far we have discussed bonds, there are a few practical problems with owning bonds directly such as lack of liquidity in the secondary markets if you want to sell the bonds early, and investment amount needed to build a diversified portfolio. As a result, investors may prefer to invest in bond funds. Debt funds are mutual funds which hold a portfolio of bonds. While debt funds deserve a post of their own, it suffices here to say that the principles that we have discussed for individual bonds also hold true for the debt funds which hold them. One major difference however between bonds and bond funds is that while bonds have a fixed maturity when you get the face value back, with bond funds you are continuously invested. Fund manager keeps using the proceeds from sold/matured bonds for buying new bonds. While some people think that this somehow makes bond funds riskier, as our discussion shows that is not the case. The only difference is that with bonds funds you are continuously getting to know the market value of your investments based on how interest rates are moving. However, investors who do not want to worry about interest rate fluctuations at all can consider Fixed Maturity Plans or FMPs. These are closed-ended funds which “mature” on a fixed date in future and only hold instruments which mature before or on this date. Since everything is held till maturity, you do not have to worry about intermediate fluctuations in the price of the instruments. Thanks for the blog. What is your take on investing in Tax free bonds vs Debt mutual funds given the availability of bonds? Are bonds liquid enough to realize capital gains? It will be sold by many bondholders who are willing to invest on the new bonds at 6%, and consequently, the face value of your bond will decrease in order to make it more competitive against current bonds. Inversely, if interest rates are decreasing, your bond value will increase as there will be more buyers.